← One more time this year…deep thoughts from the iY Generation! 2014 is almost done. 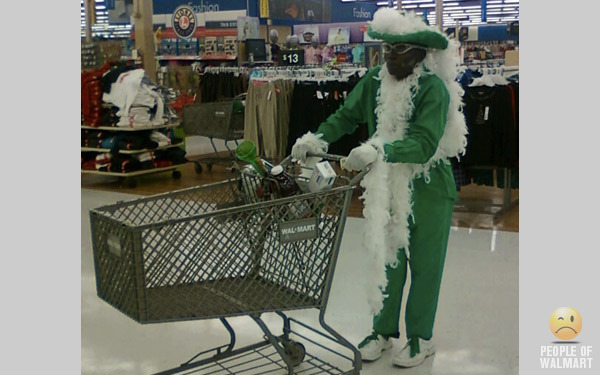 So here’s our last “People of Walmart” post of the year! In today’s “People of Walmart” edition are pics of Americans who bedecked themselves in bizarre outfits, beginning with this woman who bound herself with duct tape. This entry was posted in Culture War, Humor, Insanity, United States. Bookmark the permalink. Gosh Dr. You keep me in stitches, but I do think the first “woman” just might be a guy. I see some serious chin stubble and chest hair. If that is a true woman, oh good grief. The rest are a hoot as well. Oh where has dignity gone? Kinda liked the camo suit however I have given up suit and ties. I have a feeling some of these are Halloween costumes. Please tell me these were taken on Halloween. More dress-up people from our Bizarro New World Disorder…. I’ve only been inside a WalMart a couple of times in my life, which was a couple of times too many. I didn’t see anything like the creatures of walmart but the place had a very dark, desolate feel about it. Some Wal-Marts must be hoarding weirdos-I haven’t seen ANYTHING like this in OUR Wallyworld. LOVE IT! Thanks, Dr. Eo, for the sanity check!!! I know, I know….so sorry….you’ve been hanging out again at my local WalMart… Actually, these are quite tame compared to our usual. You should be here in summer. (Our little town has one of the only inland lakes in Southern California….) In summer you can catch the semi-clad 300-pounders wrapped in a beach towel cruising the beer and wine section, and similar thrills.